Learn how to calculate, cut and chain-piece for quick machine patchwork. Work blocks of Log Cabin, Rail Fence, Roman Stripe and a Nine-Patch block creating a simple Irish Chain. All the foundation knowledge you need to begin and an excellent way to get started. Learn fast ¼" patchwork piecing using a 4 thread overlocker, how to thread the machine and set tensions for woven cotton fabrics, chain-piece for quick machine patchwork. Make four Log Cabin blocks, Rail Fence, Pinwheel blocks and a Nine-Patch block to complete in to four matching cushion tops. An excellent way to get started with accurate sewing on your overlocker. Quilting by machine can be very easy. Learn quick ways to quilt and create fabric that can be used for cushions, waistcoats, children's clothes, linings, jackets and quilts, etc. and give you all the foundation knowledge required to work traditional quilts successfully by machine. Learn so much more about your sewing machine patterns and stitches and sewing methods. 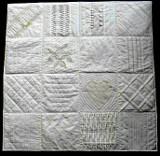 Samples include straight stitch, patterns, double needle work and freehand outline quilting techniques including BSR. Sashiko has always been worked by hand and is easily recognisable by its white lines of stitching against an indigo background. Japanese Sashiko effects can now be sewn quickly and easily by machine and you will discover various ways of working these repetitive patterns. Learn how to set-up and adjust the machine for working with heavy threads top and bottom, for use on garments, bed linen, bags, cushions and many other aspects of quilt making. Make a machine sewn sample heirloom quilt using a combination of techniques to create a white-work project including small tucks, ¼"tucks, cross-tucks, shell-tucks, pintucks, lace insertion, hemstitch and appliqué, insertion gathering, piping, appliqué and much more. Quilt quickly and easily by machine using a variety of plain and decorative stitch patterns, directional tucks, quilted insertion tucks and fast embellishing methods to assemble in to a 12 to 16 block quilt. Including instruction on cutting and piecing quilted squares, laying out, sashing and piecing blocks, plain and decorative ditch-stitching and bound edges – all sewn by machine.